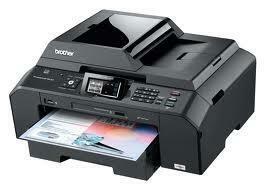 Mobile Device Compatibility	Wireless printing from your mobile device via: AirPrint? ?в„ў Google Cloud Print? ?в„ў Brother? ?в„ў iPrint & Scan and Cortado Workplace. Recommended Paper Brands	Innobella? ?в„ў Glossy 8.5" x 11" Photo Paper (BP71GLTR); Innobella? ?в„ў Glossy 4" x 6" Photo Paper (BP71GP20). Brother Plain Paper BP60MPLTR. Innobella? ?в„ў Glossy 8.5" x 11 Photo Paper (BP61GLL). Innobella? ?в„ў Glossy 4" x 6" Photo Paper (BP61GPL20). and 3M 3410 Transparency Film. Paper Handling Size - Paper Tray	Letter. Legal. Executive. Envelope (C5 Envelope. Com-10. DL Envelope. Monarch. JE4 Envelope). A4. Photo 4"x6". 3.5"x5". 5"x7". 5"x8". 8"x10"
Maximum Paper Width/Length (Paper Tray)	8.5"/14"
Carton Dimensions (W"xD"xH")	18.9" x 10.0" x 18.3"
Carton Weight (lbs)	24.9 lbs. Unit Dimensions (W"xD"xH")	15.9" x 14.9" x 7.1"
Unit Weight (lbs)	20.5 lbs.